Karrie Bowers of Morgantown, W.Va., shows how to make this Deco design that's fitting for the vintage bride. 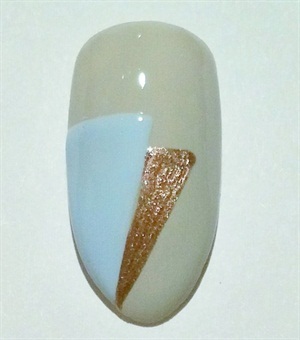 Karrie Bowers (@beautopianails) of Morgantown, W.Va., shows how to make this Deco design that's fitting for the vintage bride. 1. Paint the entire nail dove gray. 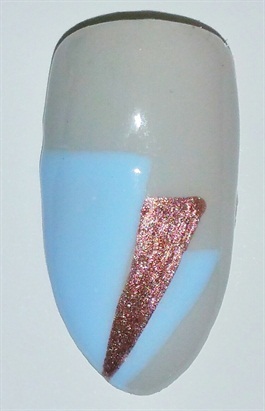 Add a long triangle with powder blue, starting at the left side midway down the nail and ending just shy of the free edge. 2. Add a rose gold triangle. Start about 1/4 of the way down the existing triangle. 3. Add a final blue triangle. Start this triangle 1/4 down from the top of the previous triangle. Each triangle becomes a bit more elongated than the last. It's important to taper the long ends of the triangles in toward the side. Add top coat.